A disabled veteran had no idea her tenant was selling weed from the room he rented, but police did, and during the raid to arrest him, they killed her. Beverly Hills, FL — A 45-year-old disabled veteran was gunned down in her own home earlier this month by cops who broke in, threw flash bang grenades, and injured an infant, all to arrest a man for selling a plant to willing customers. According to the victim’s son, she had no idea that the man she rented out a room to was selling weed. 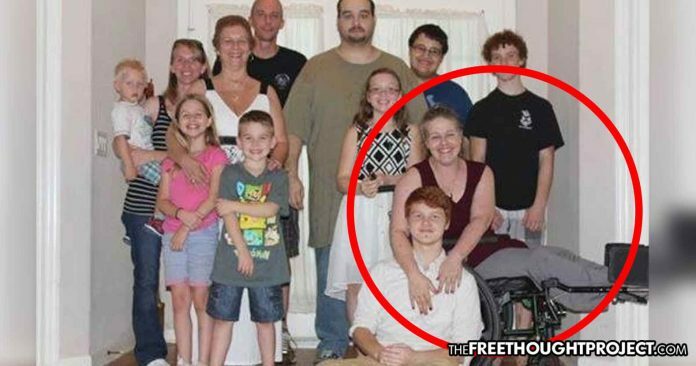 On August 30, at 6:00 am, to protect the citizens of Florida from people voluntarily purchasing a plant that has never killed anyone, members of the Citrus County Sheriff’s Office SWAT team and the Hernando County Sheriff’s Office SWAT team kicked in the doors to the home of 45-year-old Jessica Cribbs. They deployed flash bang grenades and held everyone in the home at gunpoint to arrest Cribbs’ tenant for selling a plant. Both the family and police agree on everything that happened above. However, the story of how and why Jessica Cribbs was killed varies greatly depending on whether you are talking to the cops or the family. According to police, when they breached the home, Cribbs pointed a gun at them and she refused to drop it. This prompted at least one officer to open fire on her and she was killed. Police said that two other individuals, including an infant were also injured in the melee. However, they refused to release any details about how they were hurt. None of the deputes were harmed. Just after 6:00 a.m., Thursday morning, the Tactical Impact Unit (TIU) along with members of Citrus County Sheriff’s Office SWAT team and the Hernando County Sheriff’s Office SWAT team executed a drug search warrant on 6019 W. Rio Grande Dr. in Beverly Hills. SWAT team members announced themselves multiple times before entering the residence. Preliminary information indicates that they encountered a white female subject who was armed with a gun. After refusing verbal commands to lower her weapon, the subject was shot by deputies. She was pronounced deceased at the scene. Two other individuals were injured during the execution of the search warrant and were transported to a local hospital with non-life threatening injuries. The two individuals have since been treated and released. No deputies from either agency were injured. The Free Thought Project spoke to the son of the victim who tells us that the official story released to the press is not true. Tommy Cribbs says he was in the home at the time of the raid and his mom was in her bedroom. When Jessica Cribbs, who, according to Tommy, is a bedridden wounded warrior veteran, heard the flash bangs go off, she tried to get up to see what was going on. Tommy tells TFTP that his mother never had time to grab a gun and that police shot her through a glass window. What’s more, although police didn’t mention how the others were injured, according to Tommy Cribbs, they were shot. Cribbs husband, also a military veteran, was shot in the leg and the infant girl was also hit. Both of them were transported to a local hospital where they were treated for their injuries. According to Tommy, his mother rented out a room in their large house to help a homeless man. Unbeknownst to Jessica and her husband, the man who was renting out the room began to sell marijuana. This was the apparent impetus behind the search warrant and the raid. It is also backed up by the fact that police arrested two people in the home, who are not related to the Cribbs. Cody Lynn Blagburn and Cameryn David Holloway were both arrested and charged with the alleged distribution of marijuana. They were both released on an $8,000 and $6,000 bond respectively. Police allegedly found 4 pounds of the plant in Blagburn’s room that he rented from Jessica. For 4 pounds of a plant that is legal in some form in over half the country — including Florida — a small army of militarized police officers descended on a family’s home as if it were occupied by members of Al-Qeada. In a tragic irony, they killed an innocent woman who sacrificed her own health and well-being to defend the country who would treat her like this. A travesty indeed. Tommy tells the Free Thought Project that his dad was the primary caretaker of Jessica and they were barely getting by. Tommy says that they have very little income anymore and are unable to pay for Jessica’s funeral and all the repairs to the home from the damage caused by SWAT. He has setup GoFundMe account, here to pay for the funeral and the damage.